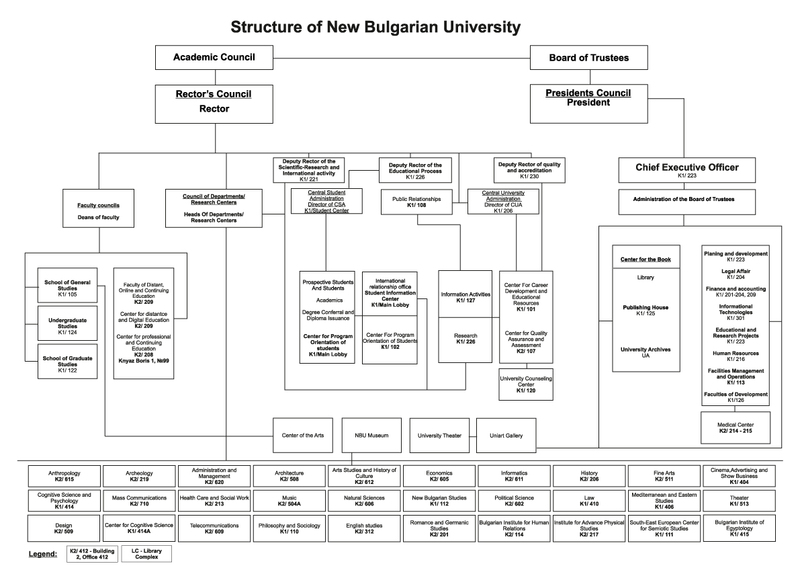 The organizational structure of New Bulgarian University is based on the principle of separation of powers with strong focus on encouraging creativity and initiative of the university community. The Board of Trustees and the Honorary President of NBU are responsible for the strategic and financial governance of the University. They define the organizational structure of the University, approve its Bylaws and Regulations, lay down its institutional and public policy, create its educational, financial and facilities management strategy and attract resources for its development. The Board of Trustees oversees the work of the following units: Strategic Development Committee; Academic Development Committee with Subcommittees on Academic Staff Development, Academic Regulations and Quality Assurance; Strategic Development Projects Management Committee; Publications Council; Directors Council; Integrated Information System Development Committee; Erasmus Committee. The Board of Trustees is supported by the Executive Director of NBU and Administration of the Board of Trustees with units engaged in planning and development, financing, publishing, archives and records management, information technologies, legal issues, facilities management and operations. Academic governance is the responsibility of the Academic Council and Rector who jointly oversee the implementation of NBU’s educational, research and international policy. The Academic Council is made up of members of the faculty, students and administrative staff from various units within the University. The academic activities are supported by Vice Rectors, Rector’s Council, NBU Conference, Enlarged Academic Council Meetings and Central University Administration. The Schools of General, Undergraduate and Graduate Education offer Core Curriculum Programs and degree programs at Bachelor’s, Master’s, and Doctoral levels enhancing the link between education, research and employment. They are governed by School Councils and Deans. Programs of study are overseen by Program Councils, Directors of Program Councils and Program Advisors. Centers for Continuing Education are governed by Center Councils and Directors and include the Center for Professional and Continuing Education at the School of Distance, Digital and Continuing Education and the School of Politics. They offer learning opportunities for applicants of all ages and professional background using a system of academic lectures, courses, programs of study and master classes. Distance learning programs offer online feature videotaped lectures of courses held on campus, with accompanying printed and visual course materials, and regular consultations with course advisors. Departments and research centers at New Bulgarian University are academic communities bringing together faculty and researchers working in the same subject area. They represent an open system connecting NBU with the world outside the university campus through participation in national and international research and creative projects, seminars, conferences and public events. Departments are responsible for monitoring the quality of faculty and programs of study and enhancing the link between education and employment. They design new programs of study and update existing ones in response to the changing needs of the labor market. Departments are governed by Department Councils and Department Chairs. NBU’s research centers include: Bulgarian Institute for Human Relations, Center for Cognitive Science, South-East European Center for Semiotic Studies, Bulgarian Institute of Egyptology.